The little pink basic yoke from here is completely smocked. Now I have this little bishop almost smocked. Just a couple more rows and some accent stitches. I planned to do all the hand work first on my current to-do pile and then do all of the construction at one time. This little bishop is the Children's Corner Bishop I have used several times, made from poly/cotton Skip Dent available at BessieMary and smocked with overdyed flosses. The overdyed flosses from Needle Necessities are no longer available, I have hoarded them for quite some time. I decided there is no sense in them dry rotting in the bin, might as well use them. It is an aqua overdyed and a pink overdyed. 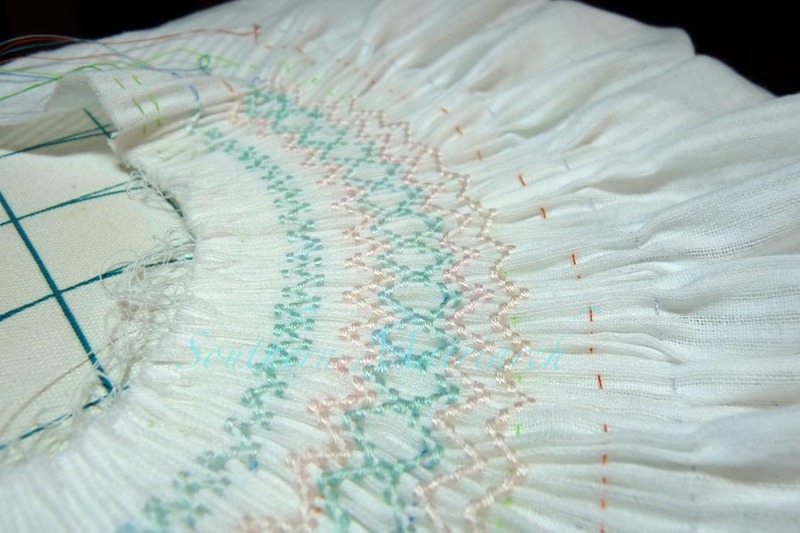 The smocking plate is Woodland Fairy from AS&E Issue # 49. Another baby gift almost complete. Two more to go. Someone was much happier today. In the past week she has become much more active. Look out. She is wearing a daygown that was posted here. 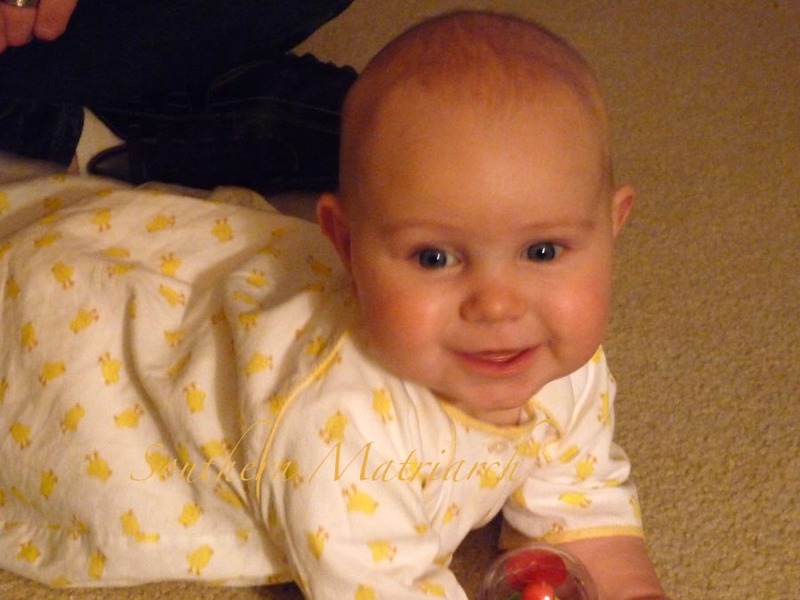 I made this daygown with a newborn's layette in mind. It just now fits! She is 7 and a half months old and 20#. I'm thinking the sizing on this one missed the mark. The sleeves are three quarter on her but it fits in the neck and chest perfectly. It just wasn't meant to be newborn sized. I wasn't a big fan of the gown out the duck pique when I first made it. It was too much duck. But on a 7 month old, the duckiness of it looks cute. Some things just need to wait for their day. As usual, your smocking looks great! I love the colors of the floss. Little princess is a real cutie pie! She's got a beautiful smile. She much be happy to be wearing the ducks! What a doll baby! She sure is growing up fast, but they do tend to do that. The smocking is gorgeous and I do love the color combination. It's supposed to be raining all weekend so I hope to get a bit of stitching time in. SOS!!!!!! I read your tutorial on pleating a bishop. At the end of pleating and smocking you say to remove your pleater threads. Well if you do that then how do you hold your pleats as you atatch your neckbinding?Even though it is smocked, I have always needed to pull them together more to fit and adjust into the neck binding. Also, do you do the back opening where it is smocked they whole way or do you leave a little placket (that is less lumpy) that can accomodate a button closure. (I know my description is clear as mud). What pattern of bishop do you use? Do you use a wooden dowel to wrap your fabric on to go through the pleater? What diameter is it? Janie, my email is in my profile. Send me an email and I can better answer your questions. There is no link to your profile. Martha, Have you tried the threads from NeedleworX? So far, I've found them to be as nice to stitch with as Needle Necessities and the dyes haven't run. I was hoping this would be the case since they were pretty much the same people doing the dying. I love the colors on that little bishop. Peach and aqua is on of my favorite combinations. Pretty thread colors ! I need to get out some of those "special" threads and use them. Evemarie is adorable in her duckies. I made a daygown out of the duck pique and felt the same way as you did -- too much duck. Also, I found the fabric stiff, even after prewashing. Perhaps I should have made a bigger size and waited. It looks precious on your "big" girl! The smocking looks gorgeous, and someone looks just adorable in her ducky gown!